US Immigration and Customs Enforcement agents arrested more than 280 unauthorized employees in a raid on National Award winner CVE Technology Group in Texas, the largest such sweep at a single work-site in more than a decade. Katrina Berger, Special Agent in Charge in HSI’s Dallas office, said ICE’s Homeland Security Investigations division received many tips that the CVE Technology Group may have knowingly hired undocumented immigrants and that several employees were using fraudulent identification documents. The allegations of hiring irregularities were found genuine during an audit of the company’s I-9 forms. According to ICE, the investigation is ongoing, and agents are questioning the arrested immigrants along with the employees of CVE Technology. Based on the investigation and interviews, ICE personnel will determine who remains in immediate custody and who can be considered for temporary humanitarian release. Still, all the workers who are determined as illegal immigrants will be fingerprinted and processed for removal from the United States. The New Jersey-based CVE Technology Group has 2,100 employees, making it the third-largest employer in Allen, Texas. In 2014, Samsung accounted for 75% of the company’s business and in 2017, the company was honored by the U.S. Dept. of Commerce’s Minority Business with a ‘National Award’. With President Donald Trump’s administration taking steps to reduce the number of unauthorized immigrants in the U.S. – including through the increase of law enforcement agents at the southern border. Currently, the United States is confronting a perplexed and controversial matter of illegal immigration. It would be appropriate to say this “illegal immigration” phenomenon is encountered by many major immigrant-receiving countries. According to US government records, there are roughly 12 million illegal residents in the States- that’s roughly equal to the entire population of the state of Ohio. Illegal immigration has a diverse effect on a nation ‘s interest and most crucial one is the negative economic effects. Hiring illegal workers damaged the nation’s economy by providing incentives that attract low-skilled workers and take jobs from U.S citizens, who refuse to work for such low wages and working condition. Businesses aren’t the only ones involved in escalating the problem of illegal immigration. Recently, ICE agents arrested dozens of University of Farmington students in a nationwide sweep for immigration violations. 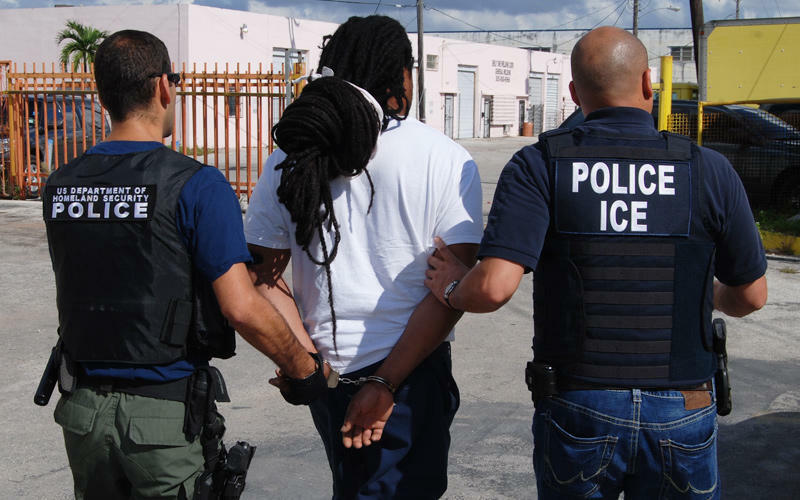 ICE has played a crucial role in carrying out Trump’s “Hire American” agenda by going after employers who hire illegal aliens for competitive advantage. Last fiscal year, for example, ICE agents deported more than a quarter of million illegal aliens, including more than 95,000 deportations of illegal aliens who were living in the interior of the country. When we consider illegal immigration, our focus is on border security. However, there are arrays of internal duties for law enforcement agencies including immigration agencies. Such as: identifying unauthorized immigrants for removal, background history, any involvement in the crime, employment verification, jail-housing screening and a lot more. From the previous illegal immigration cases and including this case, it is clear that obtaining fraudulent documents isn’t a complex task. Therefore, such tactics are repeatedly used by businesses and other institutions to deceive law enforcement agencies and further intensify their profit. The biggest challenge of mass immigration is the ability to screen out malefactors at the point of arrival. A preceding concern is a way immigration creates and refreshes immigrant communities, serving as potential incubators for future enemies. The failure to implement efficient screening processes, intelligence collection, and intelligence sharing on millions of entrants on a daily basis, can result in increased smuggling, trafficking, and more recently experienced, terrorist attacks throughout the world. Sometimes it is necessary to consider alternatives when the present means can’t provide desired results. Thousands of illegal immigrants have been arrested and law enforcement agencies still haven’t found the desired intelligence gathering and specific screening tools that could reveal what information immigrant’s brain stores within an hour. Biometric systems such as retinal scans and fingerprints can help determine whether the person matches the documents being presented, but such methods have severe limitations when documents are missing, prior biometric information of the person is unavailable, and in cases when records have been manipulated and forged. A highly advanced security solution that can directly match crime-related information directly from the brain of an individual is iCognative, produced and developed by Brainwave Science available ready to deploy for Border Security as well as Immigration applications in the US. Developed in close conjunction and at the guidance of experts in the field of counter-terrorism, counter-intelligence, national security experts from the US, iCognative is a revolutionary technology that understands the challenge encountered by immigration agencies and addresses those challenges head-on. Created with performance and practicality in mind, iCognative is designed to detect concealed information of any individual who causes suspicion or has been identified as a highly suspect individual with past criminal history. Standard practices such as further questioning and interrogation at specific border checkpoints prove unfruitful and ineffective when there are no scientific, time-efficient, and cost-effective means to verify the testimonies of these individuals. ICE officials believe that CVE Technology raid is the biggest single workplace raid in a decade. Therefore, considering the inexorable pressure on the Immigration and Customs Enforcement agents, iCognative is the best-suited forensic and scientific technology that can guarantee immediate results with an assurance that no innocent would suffer. iCognative developed by Brainwave Science is a truly disruptive technology that helps identify a perpetrator from an innocent and further reveals what specific crime-related information he/she possesses with nearly perfect accuracy. Reactions from the human brain cannot be consciously controlled, thus by default, false positives and false negatives are eliminated. Within one hour of testing, tests can reveal whether specific information, which would otherwise be concealed, is either ‘present’ or ‘absent’ in a person’s memory bank. iCognative is the only technology in the security market that is not only applicable in border security in virtually all cases where some investigation has been carried out. The United States law enforcement agencies including ICE should utilize iCognative technology in such complex cases where lack of background history and existence of fraudulent documents is highly probable. In this case, all the necessary crime-related information could be accessible and verified with almost perfect accuracy once 45 minutes to an hour iCognative test is conducted by ICE and other law enforcement personnel on CVE employees including 280 arrested illegal immigrants. Information such as: was CVE technology group knowingly hiring illegal immigrants, who hired them, how did immigrants acquired fraudulent documents, details of payments made to handlers, how much CVE technology pay, any links to crime syndicate or terror group, involvement in previous crime, identification of other known or unknown illegal immigrants or employers uplifting such practice, etc., would be easily available to law enforcement personnel to investigate this case in the right direction within a record-breaking time and provide a permanent solution to this rise in illegal immigration problem without investing billions of tax-payer money on building walls or hampering trades from neighboring countries. Details related to a case at hand are uploaded into the iCognative system. Specific screening tests through iCognative Technology enable immigration officers to corroborate testimonies of suspects by analyzing patterns of a specific brain response called the P300. For some countries, border agents and immigration officers are required to have substantial hard facts that prove an individual’s criminal record to legally turn away asylum seekers and refugees. In most cases, law enforcement has some degree of evidence but not nearly enough to legally deny admission. iCognative technology can easily cross-verify an asylum seeker’s account and determine whether the person is concealing incriminating information that he/she denies knowing. iCognative is a user-friendly technology, therefore, it could be operated by an investigating officer without the necessity of specific knowledge or skills. “Businesses that knowingly hire illegal aliens create an unfair advantage over their competing businesses,” said Special Agent in Charge Katrina W. Berger, HSI Dallas. “In addition, they take jobs away from U.S. citizens and legal residents, and they create an atmosphere poised for exploiting their illegal workforce.” With so many challenges for agents dealing with illegal immigration, the iCognative technology can provide an extremely valuable source of information and methodology, with proven and efficient results. Each successful testing brings with it new information for law enforcement that can be relevant for illegal actions, larger networks or facts connected to crimes. The use of Brainwave Science’s iCognative provides an efficient and quantifiable tool in law enforcement’s fight against illegal immigration.